Had a great turn out for the first Christian Music Festival. The day featured great music from local artists, speakers, BBQ Brats and South African Food. Thank's to all who joined us to worship our Lord Jesus Christ. rice & pansit. Or, 3 piece lumpia (philipino eggroll) served with rice & pansit. 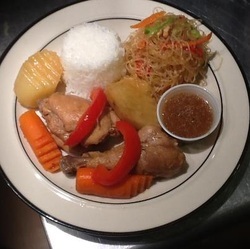 Or, coconut chicken curry served with rice & pansit. Calling All Musicians, whether groups, solo, electric or acoustic. Bernard’s Coffee Shop is hosting their First Annual Christian Music Festival. We are inviting various musicians/singers/choirs to participate in this event, playing Christian Music whether traditional or contemporary. This is a time where ALL Christian Believers can get together in fellowship and unity. A time to praise our God and meet other fellow Christians in the Globe-Miami area. There will be relevant teaching and testimonies as well. If you are a vendor and would like to participate in that capacity, please notify the Coffee Shop as well and they will give you the information you need. Since the South African dishes were a hit, we are doing it again. So, if you missed it last week, stop by tomorrow (Wednesday) during the lunch hour. Do you bore yourself eating the same thing every day for lunch? Then you should stop by @Bernard's Coffee Station tomorrow (Wednesday)! They are dishing up South African food during their lunch hour – think ground beef curry with potatoes and peas, rice and lentils, roti bread and salad. Not a fan of meat? No worries, you can opt for the vegetarian/vegan plate and still get a taste of South Africa. Be sure to tip your hat to Michelle Joshua for the meal. Michelle and her husband initially moved to Globe from South Africa in 2010, and have been hopping back and forth between the two locations since. Michelle has a history with food preparation. Back home, she was constantly involved in fund-raising and catering. Nowadays you can find her in the kitchen at Bernard's. In South Africa, there's a lot of inbreeding when it comes to food, she says. There you have South Africans, French, Spanish, Mexicans, and Indians all intermingling and sharing ideas, including culinary ones. Not unlike how we operate here in the U.S.
What Michelle is serving tomorrow is actually a fusion of South African and South Asian cuisine, inspired by her father's cooking. 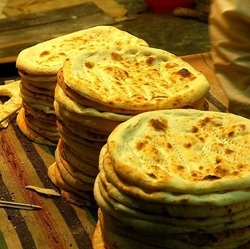 Roti is a South Asian-style bread. It's like a round, fluffy tortilla, she says. The salad includes coriander and cilantro, both very common spices in South Asia. So, toss aside the ham sandwich and chicken salad tomorrow, and give your taste buds a new experience! Today's lunch special (Tuesday) 2pc fried chicken with mashed potatoes, green beans and a roll. Thursday lunch special - Pulled pork bbq sandwich with beans and cole slaw. "Great new coffee station in Globe... Monica and Bernard will be your hosts for fine coffee, and food things.... Breakfast burritos are awesome... BLT,s for lunch are both great. Just had an excellent Angus Burger on my way home. Quaint, cozy little coffee station... BTW... Monica & Bernard "Did Build That"!!! M.J."
Hope you enjoyed the shoot as much as we did!Watch for the upcoming summer issue of the Globe Miami Times and the story, 'Sweet on Globe' by Darin. 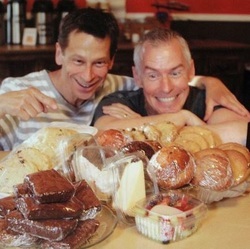 Here's a pic from the photo shoot: Darin & Jimmy ogling the pastries at Bernard's Coffee Station. Today at 4:00 pm. 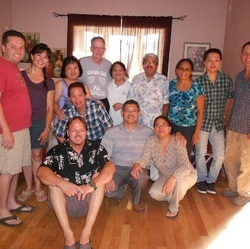 The Fil-AM group from Tempe Az. will be here with music,worship, message and discussion. They always bring good food. Come enjoy and be up lifted.